In the 17th century the land around what would become the intersection of Nassau and Frankfort Streets was part of the farm owned by Jacob Leisler. His fate was sealed when he was temporarily put in control of city government at a time when tensions between the Dutch and English were high. During an insurrection he and his son-in-law, Jacob Millbourne, were sentenced to death. Their executions were gruesome--they were strangled to death on May 16, 1691 and buried in the Nassau-Frankfort Street site. Later the bodies were reburied "with great celebration in the old Dutch Church yard," according to historian William S. Pelletreau in his 1900 book Early New York Houses. By 1810 there was a small house on the lot now -owned by Isaac Jones. He sold it to the Society of Tammany or Columbian Order on May 4 that year for $10,050. The society purchased the lot next door from Jacob Tyler on June 19, 1810 for $3,950--a total outlay of about $282,000 in today's dollars. 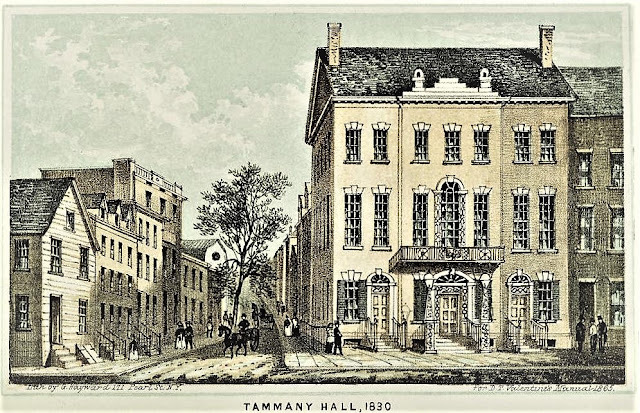 The Tammany Society was one of several social clubs by that name which arose in Philadelphia and other cities The New York society elected its first officers in 1789, its members being mostly craftsmen and mechanics along with a few professionals like attorneys and merchants. They dressed in Native American outfits, were known as braves, and were divided into tribes. Originally non-partisan, by 1795 it was solely allied with the Democratic Party. 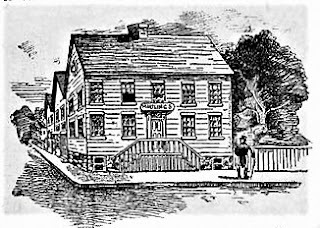 At the time it purchased the Nassau street property the group had been using the meeting room in Martling's Tavern on Chatham Street. The cornerstone of the new clubhouse was laid on May 13, 1811. Half a century later the Society's history recalled "The members of the society wore the bucktail in their hats, as usual marched in Indian file, and appeared in aboriginal costume." The building was completed within a year. The Tammany historian noted "the hall was speedily finished and became the headquarters of the democracy about the time of the breaking out of war [of 1812]." The society had erected a striking 57-foot wide clubhouse that mimicked the Georgian mansions of Broadway. Feathery leaded fanlights above the ground floor doors, a tall Palladian window at the second floor fronted by a broad balcony, and splayed lintels gave the structure a dignified domestic appearance. The stoop newels were surmounted by lanterns on high iron bases. Once a social club, Tammany Hall soon became a center of political power. It was the scene of impassioned meetings, and brilliant entertainments, such as the "grand banquet" held here in honor of Albert Gallatin, Henry Clay, and John Quincy Adams upon their return from Ghent in 1814. In 1835 the out-of-style building was given a Greek Revival update and enlarged. The peaked roof was replaced with a shallow attic, the arched openings were squared off and the upper floors were converted to the Tammany Hotel. The New York Times noted that now its main feature was "the chief assembly or ball room opening upon the balcony This would hold ten or twelve hundred people." Meetings to nominate candidates, especially for high level offices like President and Vice President were conspicuous affairs. On the day the group was to nominate Franklin Pierce for President and William R. King for Vice President, for instance, the building was hung with banners and was "brilliantly illuminated early in the evening," according to The New York Times on June 10, 1852. The newspaper added "These attractions, together with the music of Shelton's Brass Band posted in the balcony and sundry loud calls in the shape of 100 guns, fired in front of the Park...drew together a considerable crowd; and soon after the doors were opened at 20 minutes past 8 o'clock the room in which the meeting was called was well filled." The agenda of that meeting drifted briefly from the nominations to a subject that would dog Tammany Hall meetings for years--slavery. The issue of the "immutability of the Fugitive Slave Law" was brought up "with hardly a mark of approval," said The Times. Nevertheless at least one speaker voiced support of the slave-owners, saying "the man who aids the fugitive slave and helps him escape from his master is a thief and not to be trusted." One month later Tammany Hall would be decorated in much more somber bunting. Statesman and Senator Henry Clay died on June 29, 1852. Buildings and houses along the funeral route were decorated with the trappings of mourning, along with busts and pictures of Clay. 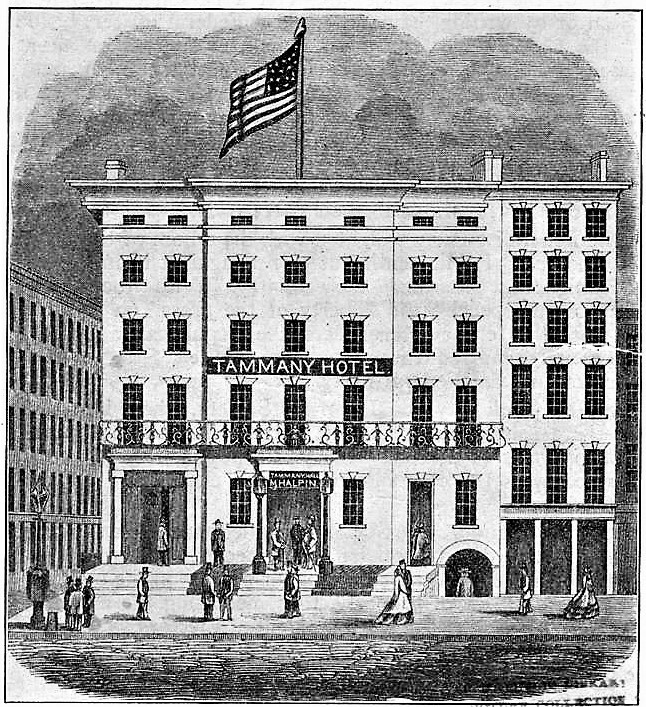 The Times described "Here is Tammany Hall, clad in widow's weeds Upon the balcony a large alcove has been constructed in which they have placed a bust of Henry Clay draped with crape [sic], the American flag on each side and the railing of the balcony is covered with the black and white, and on the arch of the alcove we read that 'A great man has fallen; our country mourns.'" Later that year on December 3, an ugly incident took place in the "coal-hole" (the basement meeting room) which supplied Tammany Hall's detractors ammunition for months. Several members had been drinking at the bar and their dissatisfaction with the vote taking place turned to violence. The New York Post reported "Tammany Hall was again the theatre of one of those disgraceful scenes which have made the politics of this City a reproach to the cause of republicanism throughout the world." The protesters barged into the meeting room and "upset the tables, threw the chairs about indiscriminately, not appearing to know or care whom they hit or what damage they inflicted." According to the article, the panicked committee members "rushed through every outlet from the room, even through the window sashes which they did not wait to open." Several people were severely injured, the most seriously being August Schell, chairman of the Democratic General Committee, who was beaten on the head with a chair, "The crazy wretch who wielded it was thrown back prostrate upon the floor when, fortunately for him the gas was put out and the fighting soon ceased." For days newspapers reported that Schell would most likely die; although he did recover. The six men arrested in what became known as the Tammany Hall Riot were found guilty for rioting. The punishment was one year's imprisonment and a fine equal to $8,000 today. 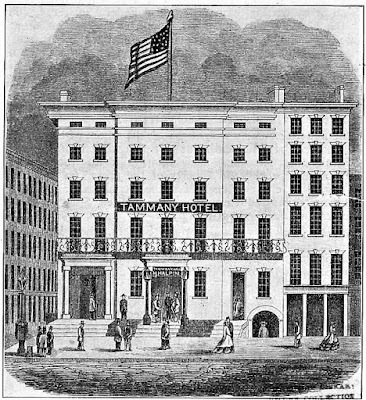 While the sometimes boisterous political meetings went on in the lower floors, the Tammany Hotel was the scene of dinners and entertainments. In March 1853, for instance The Republican Friends of Ireland announced it would celebrate St. Patrick's Day with a public dinner in the hotel. "Several distinguished Patriots will be present as guests," it promised. Newspapers were unapologetically partisan at the time. When the Daily News reported on July 7 1855 that "A secret political society called the Columbian Order, celebrated the Fourth by a dollar dinner at the Tammany Hotel," it reminded readers of earlier disturbances by adding "We believe nothing unusual occurred." The New York Times was vociferously biased in its reporting of Tammany affairs. The newspaper did not bother to veil its contempt of the society when it reported on the nomination of James Buchanan as President in 1856. Tammany traditionally celebrated with the burning of a tar barrel. On June 7 The Times reported "Tammany and tar are (politically) as inseparable, as a pole-cat and its perfume. Whenever anybody is nominated, out comes the vile-smelling, burning tar...The most probable explanation is...it is the only substance that could possibly make Democrats in office stick to the principles avowed before obtaining it." Tammany Hall's anti-slavery platform was assailed by conservative newspapers like The New York Herald. When Tammany threw its support behind abolitionist Mayor William Frederick Havemeyer in 1859 the newspaper unleashed a full-page attack. It said that "the wealthy citizens of native birth who formerly belong to Tammany when it was the rendezvous of nationality in this city have also abandoned it...All classes are flying from Tammany; even rats desert a sinking ship." It noted "The Journal of Commerce, one of the two anti-slavery organs of Havemeyer, congratulates its readers that the religious press is in favor of the candidate of the corrupt old harlot Tammany Hall, who sells her favors to the highest bidder." In fact, Tammany Hall was experiencing problems with membership, having lost repeated political battles in recent years. On April 14, 1859 The Times sounded gleeful when it reminded readers that following the French Revolution royal buildings were converted to public offices. Now, it said "Tammany Hall is to be let or leased. Nay, Tammany Hall is to be let or leased with all the fixtures!" An advertisement in the Journal of Commerce read "The house, fixtures and furniture are up for a lease but the Democracy has a permanent foothold on the premises, and will probably stay there as long as the building lasts." The celebrations of Tammany enemies were premature. Instead of abandoning the building, the group merely leased out space. The second floor became home to the Superior Court with the city paying Tammany $500 per month rent. The first trial in the space was held on June 7, 1860. "It is the suit brought to recover for brandy sold, and alleged to have been of bad quality," reported The Times. 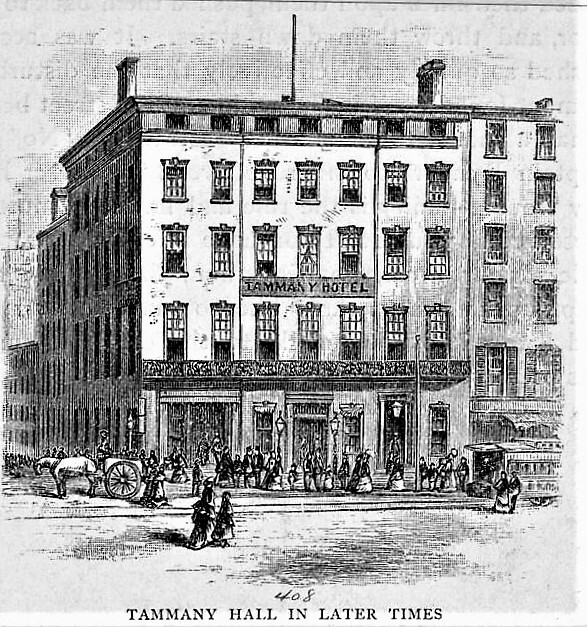 The newspaper commented "It was a matter of a good deal of humorous comment among practitioners at both the bars--the legal and the liquor selling--now in session in Tammany Hall that almost the first verdict recovered in that edifice should have been for brandy sold." Following the attack on Fort Sumter which sparked the Civil War, Tammany Hall reconfirmed its loyalty to the Union and to its long-standing anti-slavery stance On April 26 it issued resolutions which it later said presented "the whole subject of the war, its objects, duties, and claims, in a shape so patriotic and national, that they are accepted by all our citizens except those who are victims of unreasoning fanaticism, or a meaner treason, as a true utterance of the general voice." Two years after the conflict ended, on the night of March 20, 1867, the members decided to "sell Tammany Hall for what they could," get as worded by The Times. "The old house has a famous history and at one time was the seat of the political power of the country." The newspaper thought the sale was "a very proper move" given the value of the site for business purposes. The building was sold within 24 hours for $150,000. Included in the deal was the right to remove the cornerstone. 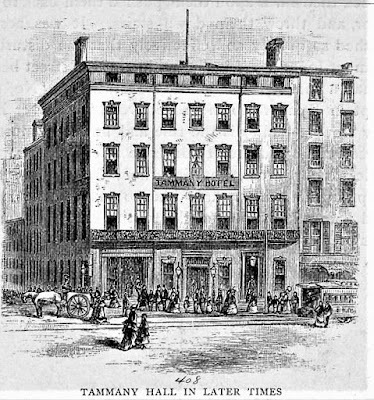 The New-York Tribune announced the sale venomously saying, "Tammany Hall has been sold out of sheer inanition and is, it is rumored, to be turned into a tavern or a second-hand clothes-shop." The Sun was more objective; explaining that the buyers, Charles A. Dana, Frederick A. Conkling & Co. "are to establish a new newspaper in the building which they have just purchased." The Express added "Tammany Hall was one of the oldest political landmarks of this city. The leading men of the country delivered addresses from its rostrum on various occasions and it has been remarked that it made and unmade Presidents." 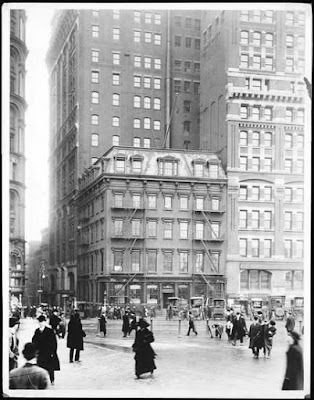 On the site rose the New York Sun Building, which survived until 1915. The site is now part of Pace University and Pace Plaza.